Born and raised in a family with strong religious values, Santos have been an immense part of my life. My Hispanic family, whose roots are in Santa Fe, provided me with my own experiences to draw upon in producing Straw Appliqué Art. For me, growing up in Santa Fe was an education in religion and art. As a youngster, attending Mass every Sunday and daily during Lent was essential for our family. The Lenten season was special. Holy Thursday was spent visiting each Church in the City. My eyes were always fixed on the many religious art pieces in each church. Throughout my childhood I partook in religious education, graduating from Loretto Academy, a Catholic School for young women. The late 50s and 60s did not provide much in the way of entertainment for youngsters. There were few theaters, one indoor swimming pool and a bowling alley. The money to partake was not readily available to me. Free places to go on Sundays were the Museums around the downtown plaza. I spent many hours touring these historic buildings and marveling at the creations. This is what drew me to pursue my love for religious art. I graduated from Loretto Academy in 1965. That same year I married my high school sweetheart and together we raised three daughters. Throughout my life I painted and drew scenes typical to New Mexico. My only formal training was when I was in high school. Three afternoons a week, I was fortunate to take art lessons on Canyon Road from such noted artists as Gian Bachacalupa. With a full time job, three children and a home to maintain, I had little time to devote to my art. Finally, after working for the State of New Mexico for twenty-eight years, I retired in 1994 to pursue my passion, a career in art. I took a half-day straw appliqué course from award winning Straw Artist Charles Sanchez in April 1996 at the International Folk Art Museum in Santa Fe. Charlie taught application and basic floral and geometric designs. The technique and beauty of the straw against the black back ground appealed to me. The floral/geometric designs alone, did not arouse my artistic interest. I knew that I needed to create art which would reflect the Santos. I painted some Retablos and incorporated straw designs. Again, I desired a more expressive means. October 1996, during a trip to New York City and a visit to the Metropolitan Museum of Art, the mosaics captured me. As I looked at the mosaics, I visualized the black background being made more a part of straw art. Returning home, I began creating Santos from straw using the black as major features on each Santo. The traditional designs are then incorporated to adorn the piece. The term for this art form is Straw Appliqué; however, I like to consider my art "straw mosaics." Pine is predominantly used in creating my art. The wood is painted black with either natural pigments or acrylics. Designs are created with wheat straw, dogwood, Russian olive bark, rose bush thorns, and any other grass or straw that will enhance my work. Straw is glued with a commercial glue and the piece is finished with a commercial varnish. Most of my pieces represent Saints, created with straw, which I like to consider straw mosaic. I use the traditional means of application, yet my design and various colors of straw are new to this art form. With much reluctance, I submitted my work for judging into the Spanish Market, March 1997. To my total surprise and excitement, I juried in. For years I admired the work of the master Santeros during the winter and summer markets. I never imagined that someday I would display and sell my art alongside them during the Spanish Market. Although my career as an Artist is in infancy, the blessings I have received have been many. Most important to me is that my work is appreciated and accepted by many Spanish Market Artists and collectors. My greatest pleasure is in the appreciation of my art. During this past Winter Market, I was delighted when Mr. and Mrs. Eliseo Rodriguez (Masters of Straw Appliqué) viewed my work. Mr. Rodriguez encouraged me to continue the different approach I had taken as he thought it was refreshing. 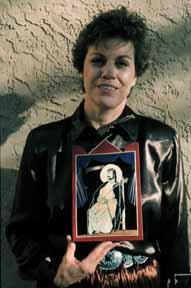 During the Summer Spanish Market, the Reverend Talitha Arnold, United Church of Santa Fe wanted to purchase a piece titled "The Crucifixion" for her Church. Being totally conscious that my artistic ability is a gift, I felt that I needed to give something in return. I donated "The Crucifixion" to Reverend Arnold and her congregation. A formal acceptance will take place the first Sunday of Lent. I am extremely excited as the Museum of New Mexico has asked to review my art as a consideration for permanent collection. Having appreciated the work in the Museums in New Mexico, the greatest honor I could possible receive would be to have my art on display in the Museum for future generations. My work was shown at the Summer and Winter Spanish Markets, the San Francisco Folk and Craft Museum, the Chili Festival in Denver, and several shows in New Mexico. I participated in the 150th Anniversary of the Guadalupe-Hidalgo Treaty Symposium (part of the Cuartocentenario activities) in Santa Fe in February 1998 and the Spanish Markets July and December 1998. My life has been blessed by my wonderful family and now by my art. Each piece created is a learning experience. Not only am I learning new techniques, but I am learning about the Santos and a means to pay them homage. Appreciation is the greatest accomplishment I can receive. All text and images © Diane Moya Lujan.